Purrfect One (ex DivOcean) is a 47ft Leopard crewed catamaran which operates in Roatan, Honduras with two experienced crew. Purrfect One is available for a range of itineraries and can accommodate up to 6 guests in 3 spacious well equipped cabins. She is equipped with a range of small luxuries and excellent facilities including dive equipment. What makes Purrfect One special is not only the luxurious touches of comfort added to the boat, but her enthusiastic and experienced crew Ken & Marie Carrothers. This Leopard 47ft catamaran is a very well equipped charter yacht and dive boat and we can tailor each itinerary specifically to suit your personal needs and preferences. Gratuity is not included in the package and is dependent upon your experience of the excellent service your crew has shown you. Remember they are there for you 24/7. Please note that the rates above are quoted in Canadian Dollars. 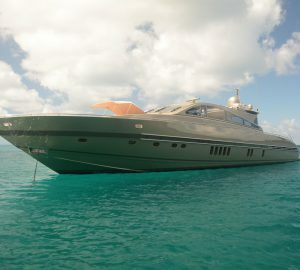 This Leopard 47 crewed catamaran Purrfect One can accommodate 6 guests along with her two crew in 4 separate staterooms. Each air-conditioned guest cabins is equipped with custom touches including original Caribbean artwork to large LCD screen with DVD player for total privacy. Each cabin is also equipped with private ensuite bathroom. Purrfect One (ex DivOcean), a Leopard 47 catamaran is equipped with a huge range of amenities and toys including a 12 ft dinghy with 30 hp outboard, Wind surfer, Kayak 2 pax, Tubes, Wake boards, Knee boards, Floating mats/noodles, Snorkel gear, Onboard diving equipment, Air compressor, Oxygen kit/First Aid, Large swim/dive platform on transom, Fishing gear. Further entertainment includes: TV/DVD in the salon, Stereo with iPod dock and Sirius satelite radio/speakers inside and out, Bimini hard top for shade in cockpit, Deck shower, BBQ, USCG Safety equipment including oxygen kit, Icemaker, Generator 8 KVA, Inverter for 110 V, Water maker 50 gals/hr Hammock, Book exchange, Windscoops for all hatches. Leopard Yachts of Italy produce fast, sleek and streamlined luxury yachts as designed by a number of leading international yacht designers and as recognised by several yachting awards.